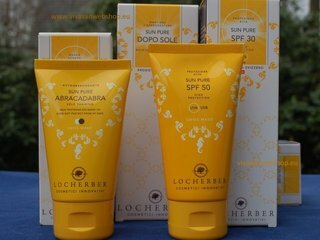 Locherber Sun Pure Sun Protection from Locherber Milano - Vivasan Webshop English - World wide delivery Vivasan Official Webshop® is specialized in shipments to the UK, Ireland and Scandinavian countries. Best prices! The Sun product line SUN Pure from Locherber offers a precise formulation in order to achieve an efficient way to work and a safe result, with concentrated protective ingredients, stimulators for tanning activity and an anti-ageing reparation function for all types of skin during the three phases of the tan process.